1984: “It was a bright cold day in April, and the clocks were striking thirteen.” Well, not quite, but the vision of that year as depicted in Lucy’s film choice last night was not a million miles away from George Orwell’s vision of a rigidly controlled society under constant surveillance. After some delicious food and some distinctly (un)rock ‘n’ roll beverages, the film fascists were treated to Florian Henckel von Donnersmarck’s Oscar-winning film about a Stasi agent in East Germany, The Lives of Others. 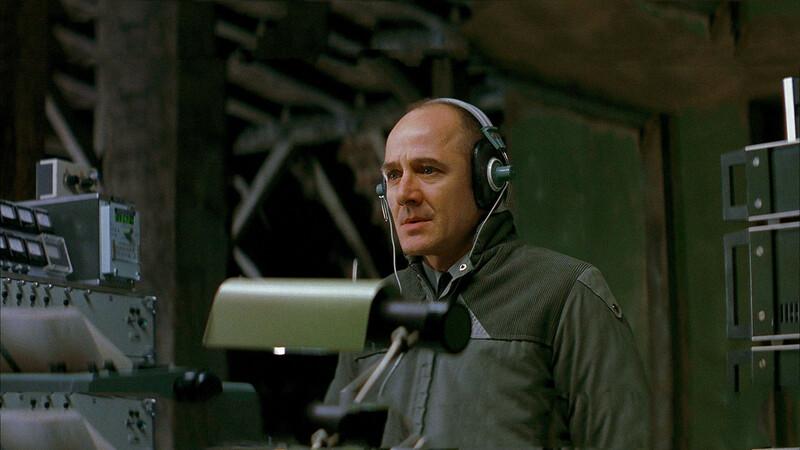 The film follows Stasi officer Gerd Wiesler as he discovers his humanity whilst undertaking the surveillance of a well-known playwright – Georg Dreyman – and his actress girlfriend – Christa-Maria Sieland. Initially a model citizen, comrade and believer in the East German system, Wiesler becomes disillusioned with the power games played by his superiors whist simultaneously realising the relative emptiness of his life compared with that of Dreyman and Sieland. The changes in Wiesler’s character and his attitudes towards the people around him lead him on a course of action which ultimately leads to his own professional downfall, but which could be seen as heroic. The film would have had particular resonance for Mühe; he grew up in East Germany and became a well-know theatre actor constantly under surveillance. He even alleged that his second wife, an actress, informed on him to the Stasi although she always denied it. (Random fact: according to Wikipedia some people allege that Angela Merkel was a Stasi informant!) Sadly, Mühe died of cancer the year after the release of The Lives of Others. Whilst there was a general consensus amongst MNFC-ers that the film was excellent and that the behaviour of Wiesler was believable, many critics felt the film to be too unrealistic in its portrayal of official Stasi activities – in spite of the fact that all the surveillance equipment used in the film was genuine Stasi equipment on loan from museums and collectors – and that no genuine Stasi agent would have been able to show such compassion and get away with it. This article in the Guardian offers an interesting alternative perspective, and touches on what has become known as ‘Ostalgie’, a kind of rose-tinted nostalgia for the days of the DDR. Nevertheless the film went on to win the Academy Award for Best Foreign Film in 2006. We had some serious discussions about the nature of heroism and the motivations for Wiesler’s behaviour, questioning whether we would behave heroically if put to the test, and also the chilling thought that such activity happened within our lifetime in a country so close to us. Parallels were drawn with recent MNFC feature The Conversation. However, there was also the inevitable comedic chin funny bone-stroking which covered such topics as the availability of communist Wagon Wheels, Stasi agents going through evil police academy, the comparative merits of the 60 Minute Makeover team and a Stasi surveillance installation team and the subsequent disappearance of Claire Sweeney, and how David Hasselhoff brought down the Berlin Wall. I’ll leave you with some music to end. First, Sonata for a Good Man, which when played by Dreyman has a profound effect on Wiesler, and which was composed specifically for the film. Secondly, this vision of the The Hoff performing in a flashing jacket on top of the Berlin Wall. I’ll let you choose which you would prefer to hear. Another cracking review Becca!! Good choice of film Lucy! We look out for Jonf’s heads up that the reviews have been posted now so that we can virtually be a part of MNFC! Perhaps a touring MNFC session is in order!